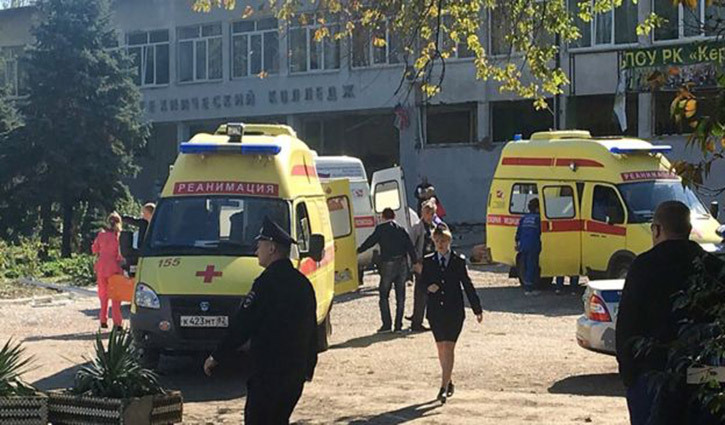 International Desk: At least 19 people died in a blast in a technical college on the Crimean peninsula, with dozens more injured, Crimean head Sergei Aksyonov said on state television on Wednesday. "It's a colossal tragedy, 19 people died, and 40 more injured, for the time being," Aksyonov told Rossiya 24 channel, after authorities earlier said 50 people were injured. A student carried out the attack and shot himself, according to the leader of the Russian-annexed peninsula Sergei Askyonov. Most of those killed or wounded are teenagers. Russia's Investigative Committee, which probes major incidents, said it had "opened a criminal case into a terrorist attack" after an "unidentified explosive device" went off in the polytechnical college in Kerch city. Investigators said the explosive device went off in the college's canteen and that it was "packed with metal objects." "Currently we know of 13 dead and around 50 injured," Investigative Committee spokeswoman Svetlana Petrenko earlier said in televised comments. The "most of the (victims) are teenagers," the committee said. The college's website says it accepts students in the last three grades of school, from the age of 14. An unnamed witness who worked nearby said in a video on Kerch.tv website victims "were taken away in public transport, in minibuses and buses, with 2 or 3 people in each ambulance." "They are children and staff," the witness said. "I saw people without legs, without arms. Kremlin spokesman Dmitry Peskov said President Vladimir Putin had been informed of the "tragic news" from Kerch and that he "expresses deep condolences to those who lost relatives and loved ones." Crimean leader Sergei Aksyonov said on Facebook he had gone to the scene and "all the necessary services are working at the scene of the incident." The emergency services ministry said that it had flown out three helicopters and a plane with rescuers. Kerch is linked to the Russian mainland by a bridge opened by Putin in May this year.